We were recommended to eat at the The Bubba Gump Shrimp Co Restaurant and Market by friends who had recently returned from Orlando. We were not dissapointed! As usual our busy schedule when we visited Orlando in December left us with “too much to do too little time” so we decided to make a lunchtime visit to Sea World taking in all the afternoon shows. After seeing the 6pm showing of “Believe” it only took a few minutes to drive to Universal Studios. Parking after 6pm at Universal was free. Bubba Gump is situated at the end of the walk ways on the left hand side by City Walk. 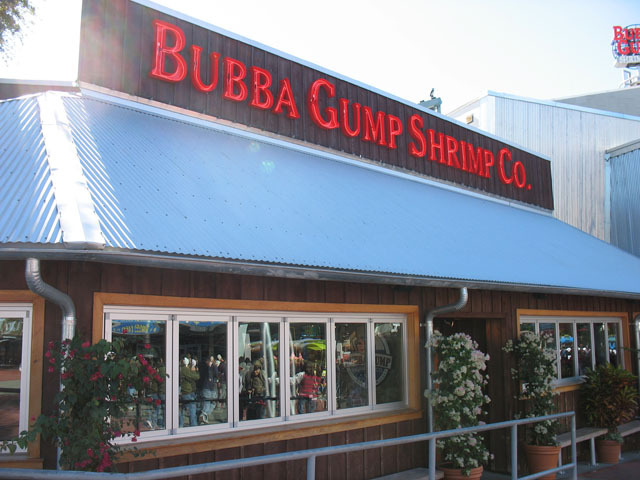 It is a chain of seafood restaurants inspired by the 1994 film Forrest Gump. It was the first themed restaurant inspired by a film and the first restaurant was opened in 1996. 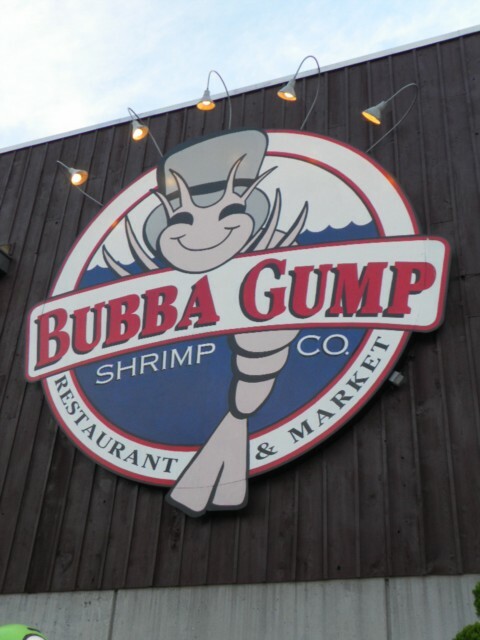 This fun family restaurant serves shrimp, shrimp and more shrimp – plus other menu selections, from great seafood and steaks to sandwiches, appetizers, desserts – plus loads of memorabilia from the film Forrest Gump. Whilst we were there it was open 11:30am to 12:00am. What we were not aware of until we had been at our table for about 10 minutes and seemingly being ignored by all the serving staff was that the restaurant has also gained fame for its unique paging system consisting of two license plates on the tables marked " Run Forrest Run" from Jenny’ s famous quote and " Stop Forrest Stop" based on the signs used to help Forrest when he played football at the University of Alabama! The " Stop" sign is used to signal that a table needs service and " Run" means that all is well. We had our sign on “Run” so when we changed it to “Stop” we got immediate service! The Restaurant looks small from the outside but when we entered we were quite amazed at the seating capacity. We, as were most guests that arrived, were seated in the front more open section looking out onto the Cinema and busy walkway where we “peple watched” whilst we waited for our meal. My Father opted for and thoroughly enjoyed a “Bucket of Boat Trash”. This comprised of deep fried tender shrimp, lobster and mahi mahi . Mother and I had cajun spiced mahi mahi with bourbon sauce and shrimp served over mashed potatoes, whilst the girls chose Southern Fried Shrimp. Although the adults did not have room for a dessert the girls managed to share a Chocolate Cookie Sundae. I must admit this looked great with a warm, fresh baked chocolate chip cookie and vanilla ice cream, caramel, chocolate, peanuts and whipped cream. I must remember to leave room for one next time. At the end of our meal we visited the store, which had a great selection of souvenirs. One of the girls bought the “Run Forest Run” plate, which now adorns her bedroom wall, and I could not resist the temptation and bought a “Big Box of Chocolates”! We all agreed we will be returning to Bubba Gump on our next visit. Viewed 5563 times since 1 September 2008.